Obituary – Humphrey, Raymond Robert « Perry High School Alumni Association, Inc.
Raymond Robert Humphrey, 35 years old, passed away late Thursday afternoon in Lucien, where he had been ill for the past seven weeks. Humphrey, born northwest of Perry, had lived in Noble county all of his life except for a period of work in Ponca City. 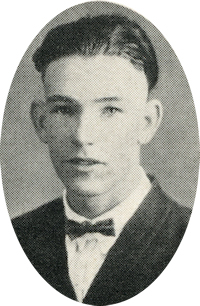 He graduated from Perry high school in the class of 1924, attended business college in Ponca City and was named bookkeeper for the Marland rock crushing company of the city after graduation. Survivors include his parents, Mr. and Mrs. William Humphrey and the following sisters and brothers: Mrs. Maud Peden of Perry; Mrs. Allie Dixon of Ponca City; Mrs. Ora Hill of Delta, Colo.; Ernest Humphreys of Topeka, Kansas, and Noble Humphrey of Sacramento, Calif.
Funeral services will be hold Sunday from the chapel of the Davis Funeral home at 2:30 p.m. with Rev. T. J. Durham of Lucien in charge. Burial will be made by the Davis firm in the Grace Hill cemetery of Perry.